London (10 Nov 2014) – Mitre have partnered with six ASEAN countries to provided a football apparels and accessories. These six ASEAN countries are Indonesia, Malaysia, Myanmar, Philippines, Singapore, and Vietnam; which each of these countries signed a ten years contract with Mitre. “it was the best deal ever which is too good to pass and Mitre is providing us with three jerseys of home, away and third also same as the goalkeeper jerseys” said Dr. Tran Quoc Tuan, Executive officer of Vietnam Football Federation. The contracts will start in 2016 until end in 2026. 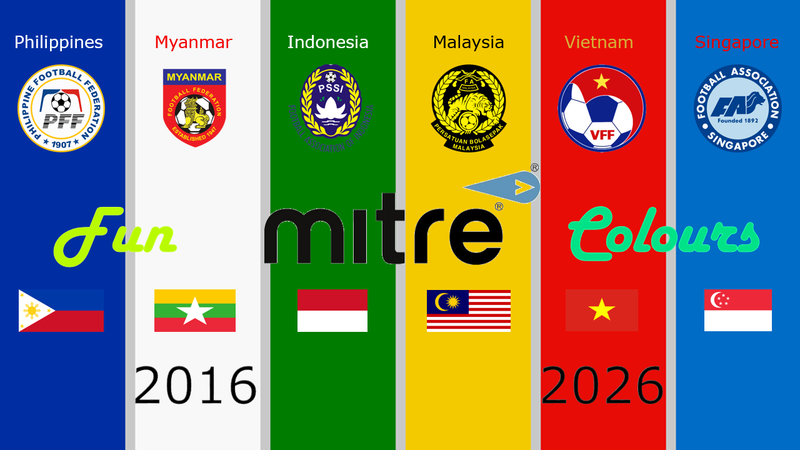 Mitre will supply the six ASEAN countries national team shirt for U-16, U-19, U-23, senior men, women and the futsal teams. The contract will provided the national teams with all new Mitre persona touch which incorporates world-leading technology updates and innovative and modern design that help to enhance movement and overall performance on the pitch.” We will not provide our new partners with basic templates but we will design a jersey that would be fitted on the cultures of each six countries in ASEAN” said Henry Brandine, Mitre director of Asian-Pacific. The six ASEAN countries are categories as “Fun Colours Teams” in Mitre Persona Touch.”Finally we could see the different persona design on each of six jersey” said Joko Priyono, a member of PSSI. The offer of contract is about GBP 38.5 million (USD 61.2 million) to each the FA of six countries over the ten years. You are currently browsing the Andy1890's Blog blog archives for November, 2014.